Being able to have your office in your plant or facility is very useful. Now more than ever employees need an area where they can file the necessary paperwork, get computer work done, or simply have a quiet place to relax. Being able to have a place where supervisors can oversee the work going on in your plant or facility from a safe distance is important too. 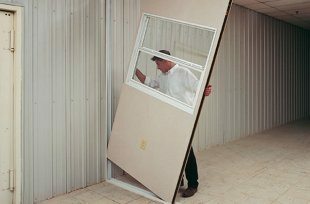 Here are Panel Built we offer the best solutions for having an office inside your plant or facility. With our S/BG panel system you’ll have the best office environment for your employees in the building. What are the S/BG Panels for In Plant Offices? At Panel Built, we use a variety of panel systems for many of our products. This includes security booths, offices, quick ship metal buildings, and more. When it comes to an office inside the plant, you need to meet a variety of specifications to make it a good working environment. For one, it has to be quiet. Work going on in the plant or facility can reach a high volume. Heavy machinery being moved, orders being called out, product being transferred, and other loud noises can be a distraction. Second, it has to be temperature controlled. The office can’t be to hot or cold for your employees. Thirdly, it has to be able to house electrical wiring and connections. It’s a work environment, and you’ll probably want to have a landline and computer running through there too. So you need to make sure the electrical components are safe. This is where the S/BG panels come in. These walls are 3” thick, and use composite sandwich panels as their design. On the outside is a 26 gauge stucco embossed steel sheets for protection. At the core is a 2 5/16” polystyrene core to help keep out noise. On the inside facing the core is a ½” vinyl covered gypsum board that’s been laminated with a 1/8thhardboard. Every 4′ on the interior and exterior divider strip and a metal c-channel. Together, these act as a weather tight connection between the panels. S/BG wall panels are cost effective, low maintenance, and durable. They’re one of our most innovative panel systems we have to offer due to their solid design and ability to withstand a lot of pressure. So your employees can work in peace if they have computer work to do, have to make phone calls, or just need to oversee the facility or plant from a safe place. 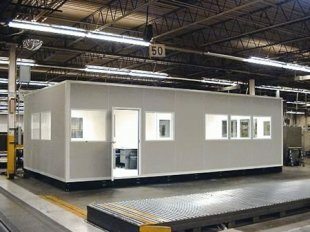 How Does a Modular In Plant Office Help My Business? Having an in plant office right inside your facility can give a whole host of benefits. For one, it provides a quiet, productive work environment for your other employees. If you have supervisors, managers, or anyone else who needs to take care of computer or paperwork for your company. They can do it right in the facility. Due to the superior design of the S/BG wall panels they’re able to work in a temperature controlled environment that’s comfortable for them. Not only that, but having an office inside your facility is safe too. If you have visitors to your facility, you need a place where they can look over the work being done without being right in the middle of it. This provides an excellent place to receive such people and to discuss any business they may have there. You also don’t have to use the office as just an office either. Many of our buildings have been used just to provide employees with a break room to lounge in. Having a break room in your facility where your employees can take their break or have lunch contributes to their comfort too. No one wants to eat their lunch out on the floor where work is still going on. Giving them a quiet place to eat not only shows you care about your employees but keeps them out of the way while they rest too. Taking a break is a way for them to recharge and to relax for a while. So once they get back on the clock, they can head right back into work feeling refreshed. An office in your facility can help to increase productivity, provide your employees with a safe place to take a break, and be a great place to receive visitors to your facility. At Panel Built, we believe in only delivering the best high quality products for our customers. We’re always pushing forward to improve them and are more than happy to answer any questions or concerns you may have.